I took the wife today for a leisurely drive to Santa Barbara County for a well-deserved Friday afternoon. wine tasting sojourn. The Santa Barbara wine country is just a good hour and a half from our residence. On the way, she decided to drop by her favorite entertainment spot in the area, the fabulous Chumash Casino. The place is the very same venue where Vic Darchinyan fought and KO'd our very own Diosdado Gabi to keep his IBF and IBO flyweight titles a few months ago. To my surprise, there was a scheduled SHOBOX presentation at the grand ballroom of the casino. 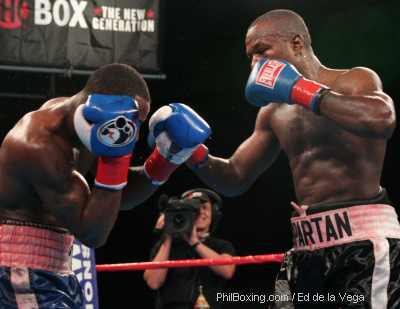 Checking the evening's card I found out that the featured main event is the NABF light heavyweight title bout between 175 lbs., Chad Dawson (21-0-1NC) (15KO) and 174 lbs., Eric (Magic2000) Harding. (23-3-1) (7KO). Checking out the fighters, it was so ironic that they both come from the State of Connecticut. Dawson, the challenger, is from New Haven while Harding, the champion, is from West Hartford. They were also spar mates. 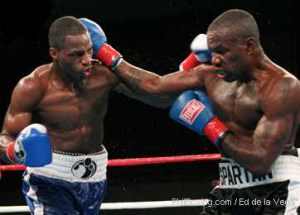 34 year old Harding brought in the young Dawson, 24 in preparation for his fight with Antonio Tarver in 2002. The main under card features 1241/2 lbs., Mario Santiago (14-1ND-) (9KO) versus 126 lbs. Lenny Victoria (8-3) (2KO). They will tangle for the vacant USNBC featherweight title, a minor title of the WBC. At Chumash, I immediately sought out the person in-charge with media credentials so I can go see the fight. I thought it would be nice to cover a fight for PhilBoxing and the local Filipino newspapers in the Southern California area that does not involve Filipino fighters. I was referred to a very nice lady, Ms. Veronica Sandoval who is in charge with media credentials. Ms. Sandoval was so gracious enough to give me credentials when I introduced myself and the news outlets I represent in spite of the fact that credentials are normally issued ahead of the scheduled fight day. Call that lucky? Wait until I tell you what happened at the slot machines after the fight! But that's for later on this article. Mario Santiago of Ponce, Puerto Rico won the UDNBC featherweight title by a resounding 7th round TKO over Lenny De Victoria of Philadelphia. With his win, he improved his record to 15-0 (10KO's). DeVictoria on the other hand, dropped to 8-4 (2KO). Santiago's relentless body punches and strong upper cuts spelled the end for DeVictoria. The referee stopped the fight towards the end of the 7th when DeVictoria was trapped in a neutral corner and was absorbing punches without visibly throwing some in return. The Harding-Dawson match was a dogfight from the get go. Harding dropped Dawson in the middle of the first round but the younger Dawson easily beat the count and even managed to score some head shots of his own until the round ended. The end of Harding started in the 5th round when blood started oozing from his mouth. The flow continued all through the end of the bout. The body shots thrown by the younger Dawson begun taking their toll towards the end 6th. From that time one, the end was inevitable. It was just a matter of time and the champion was to lose his crown. After the bloody 12 rounds of boxing, wherein both fighter's trunks were covered with blood, mostly from Harding, there was no mistake as to who is the victor. The younger Dawson beat out the veteran champion and took his crown away via a unanimous decision. 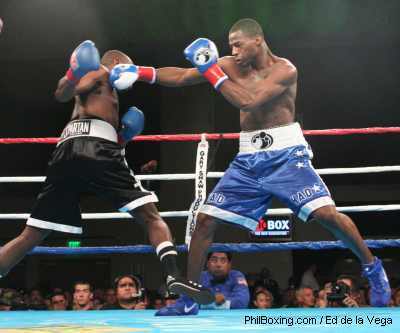 Two judges concurred at 117-110 and the other 116-111 all for the new NABF Light Heavyweight champion, Chad Dawson. Oh, about the surprise at the slots machine at the casino? No big deal. The old lady next to me won a jackpot. Maybe I will be luckier next time.